Photo: River Valley owner Walter Tzachuk and Paul Knowles. It may be a cliché, but that doesn’t mean it is not true: “People never visit tourist attractions in their own back yards.” Talk to people in the Niagara area – they never venture down to the Falls. Ask Torontonians whether they’ve visited the CN Tower or the Ripley’s Aquarium. Nope. The same principal may well apply right here in Perth County. There is a nice menu of attractions, restaurants, and recreational opportunities right here at home, but it’s a good guess many locals miss them. I had the opportunity sample from that menu when Sarah Franklin of Perth County Tourism asked me to help organize a three-day visit by a couple of golf and travel writers – and then invited me to join in. It was a terrific, local treat. There was golf, of course, given the professions of the visitors. 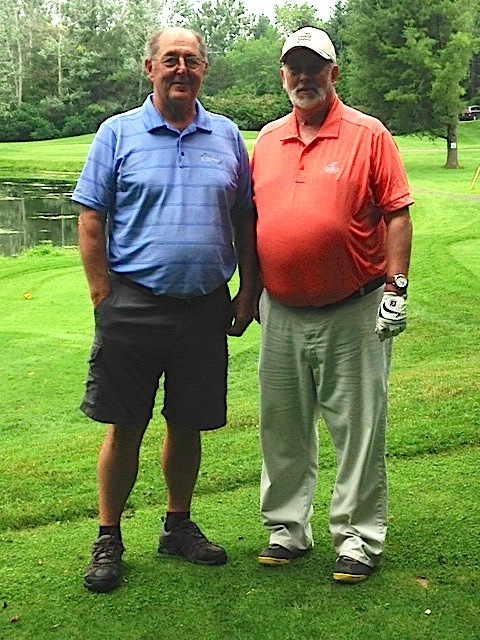 We played three courses – Mitchell, River Valley, and Listowel. All very different one from the other, all interesting courses. My colleagues gave thumbs up on all three. If you are a golfer, and haven’t played one or more of these golf courses, step out of your comfort zone and make a tee time. Personally, I like the Mitchell course very much. It’s challenging but it doesn’t beat you up (a relatively easy hole is likely to follow a toughie, except on the very well-designed final four), and it’s always in great shape. I’m consistently impressed with the design – even though I’m told the older, front nine may have been designed by a volunteer committee, back in 1930. The course is so pleasing to the eye that it’s easy to forgive the tougher holes, like the par 3 ninth, or par-five, wet and wild 15th. The River Valley course destroyed all my presuppositions. I knew it was a short course – and figured it might be easier. Hah! Let me just say that I will play it again, and I will play it knowing the right clubs to use on particular holes so I don’t lose a basket of balls next time. That’s the plan, anyway. A highlight for the three of us was having lunch with course owner, and former NHL player, Walter Tkaczuk, a very convivial host. Listowel is a beautiful, 27-hole course, professionally managed and care for, and a delight to any golfer. We played the Heritage and Vintage nines – and enjoyed them very much – before taking a cart around Millenium, the newest definitely the most challenging of the three nines. Photo: The goods at Stonetown Artisan Cheese. But our three-day visit involved so much more than golf. We ate, and we ate very well, sampling the cuisine at some fine Perth County eateries. It must be said that all three golf courses have some pretty tasty items on offer, and we took full advantage at all three places. It’s not haute cuisine, but after a day on the links – or a day touring the country – you probably don’t want a high end menu, and the options at all three places were very satisfying. We also shared a fine lunch at Dave’s Diner, in Sebringville. Well, when I say “lunch” – Dave’s offers that irresistible option, all-day-breakfast, and I couldn’t resist ordering an omelet. It was tasty, laden with all the extras I had asked for – and more than filling. That, by the way, was the two-egg omelet; I can’t imagine handling one of the larger options. We arrived for a dinner at Anna Mae’s Bakery in Restaurant in Millbank to discover that the “buggy table” had been reserved for us. That’s a special treat – and a little embarrassing, since the restaurant, I’m told, is almost always packed to the rafters, and everyone else clearly wonders who it is who rates the special black upholstered seats (with wheels attached) in the centre of the room. We soon forgot that we had an audience; we all admitted we were not very hungry, and then immediately ordered the full meal deal, two opting for the famous broasted chicken and one, roast beef. With all the trimmings. And, of course pie. Delicious, generous slices of pie. One of the not-so-hungry among us even left with a bag of cinnamon buns. Sarah had arranged a busy schedule for us, including a stop at the Shakespeare Brewing Company, where we sampled a flight of their craft beers. This fledgling craft brewer is a great story – a business founded by Ayden and Katie Gautreau, who are the only employees. This is a labour of love – and you can taste that love in their excellent brews. Of the beers we sampled, I was especially struck by the unique Bumbling Bear Blueberry Wheat Beer (light, refreshing, unexpected) and by the Classy Cow Milk Stout, a delicious surprise to a guy who doesn’t normally fancy stouts at all. 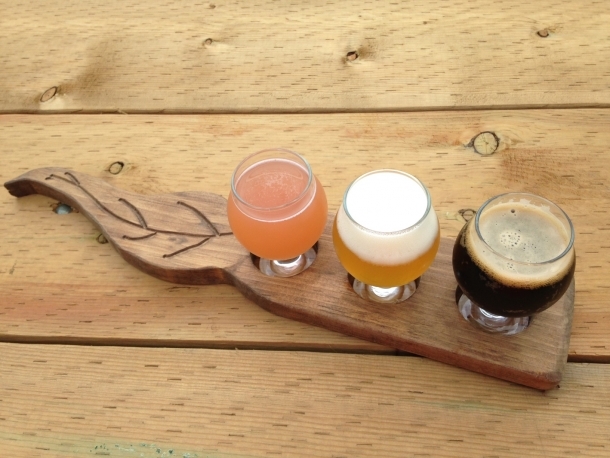 If you aren’t in the habit of dropping by Shakespeare Brewing, you should probably change your habits. 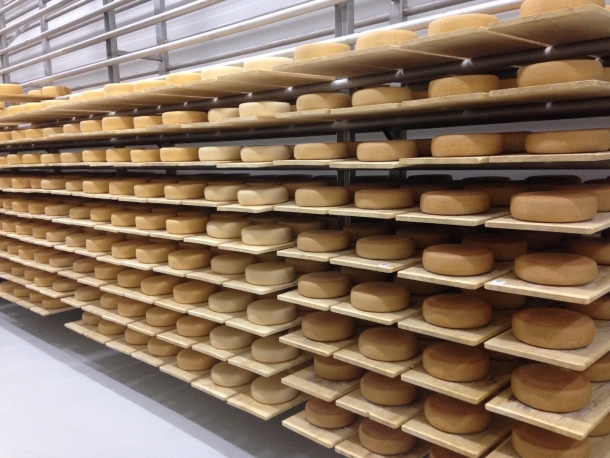 We also visited Stonetown Artisan Cheese, on Perth Line 8, just outside St. Marys. The tour of the facility was fascinating – this is state of the art stuff that produces a unique and highly enjoyable palette of products – and we tasted as many samples as we could to verify this fact. Stonetown Cheese is a classic example of a holistic agri-business, as Hans Weber and his team carry the process through from the dairy herd to the finished cheeses. We managed to cover almost all of Perth County in our three-day visit, but I know there is still more to experience. – the Stratford-Perth Museum, for example, or Science Hill Golf Club (the one that got away), or BJ’s Ice Cream Emporium in Mitchell, or… more than enough for a second staycation, I think.